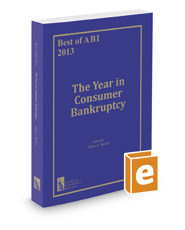 The best ABI Journal articles and selected papers from the American Bankruptcy Institute's top-rated educational seminars are compiled in this must-have edition covering the most important developments in consumer bankruptcy for 2013. This edition delves into such timely topics as individual chapter 11, divorce and dependent children issues, lien-stripping, student loan discharge, mortgages, tax issues, and much more. It also features relevant case summaries drawn from ABI's Volo site (volo.abi.org).